Flower plot blue lobster! A real Maine lobster buoy! What a great addition to your flower pots! Color of lobsters white, red or blue let us know at check out. 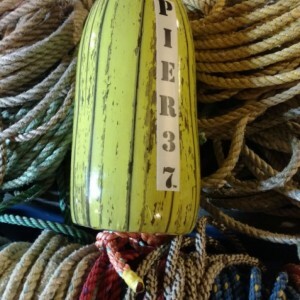 Each buoy has it's own serial number! A blue lobster! 5X11 buoy Outdoor gloss! Roughly 20" tall Solid plastic 5 1/2 pot 5 deep Pot also comes in red Wooden down attachment! Great nautical, coastal look!